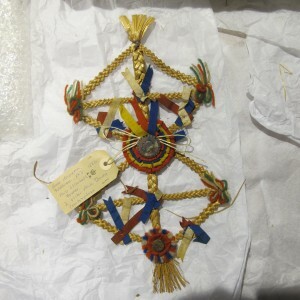 We have now done all the research sessions in our partner museums – this constitutes the first stage of phase 2 of the Woven Communities project. Dawn and Steph went to the Highland Folk Museum at the end of April, and then on to An Lanntair and Stornoway Museum in Lewis. Liz, Julie and Steph went to the Museum of Rural Life at East Kilbride in May, while Liz and Steph went to the Scottish Fisheries Museum in Anstruther in June. At the Highland Folk Museum, we saw a wonderful collection of creels, bannock baskets, and ciosans and bent grass horse collars from the west coast and the Western Isles. There were also Traveller frame baskets and ropes, along with ‘woodies’, horse bridles made from twisted willow or pine root. 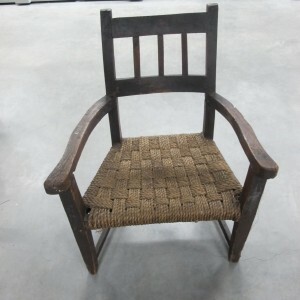 The use of bent grass from Lewis and the Uists was ubiquitous, even for chair-seat weaving. Stories are told by even small pieces of documentation. One evocative label on a bent grass woven-seated arm-chair read “sold by a woman lone and poor” from Harris. 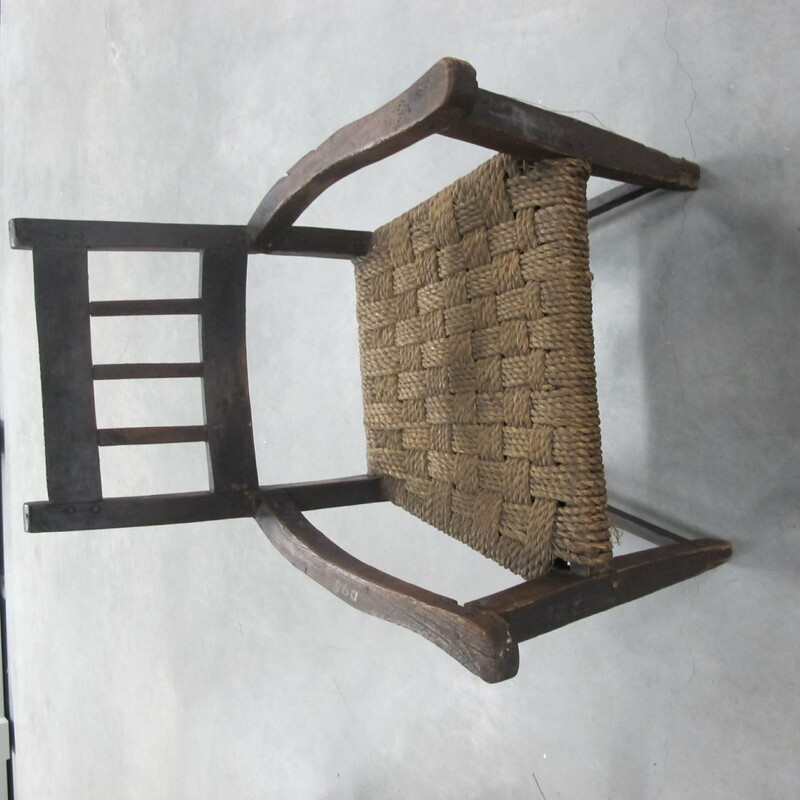 In the late 19th and early 20th centuries, an arm chair was a valued home item, a piece of luxury, even if it was plain wood with wooden arms and a woven seat. This woman from Harris sold her last piece of treasured of furniture to gain some needed money. On Lewis our partners at An Lanntair took us to see the only ciosan with a handle known to exist, now being displayed at Stornoway Museum. Our basket-maker, Dawn Susan had discovered this at her local History Society in the initial Woven Communities project. The Museum recognized that this coiled marram- (bent-) grass ‘bread basket’ was worthy of a special place in its new gallery. 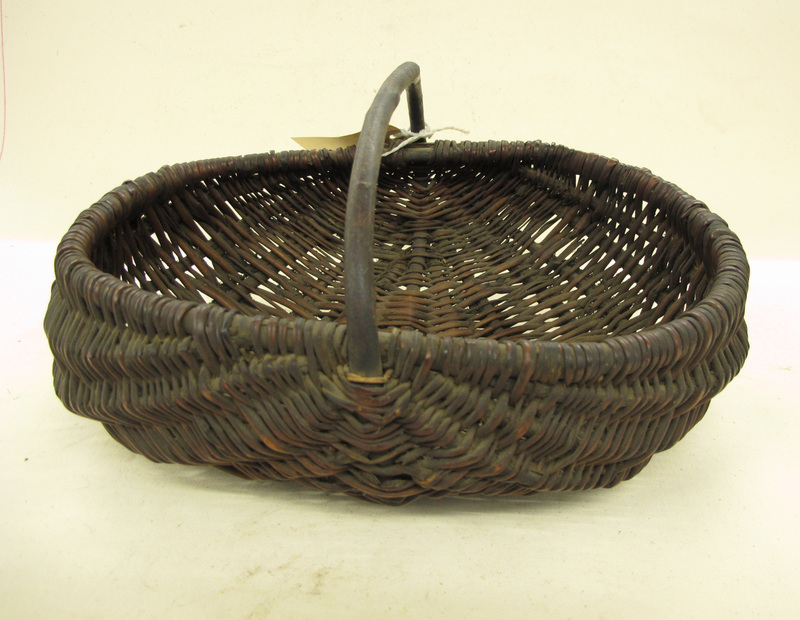 We are still trying to find out more about these little known baskets, – no one we have met so far can remember a time when they were used, or even has stories or photos of them from their ancestors. We are not even sure of what they were used for. One thing seems certain, though, is that they were works of great skill and patience. 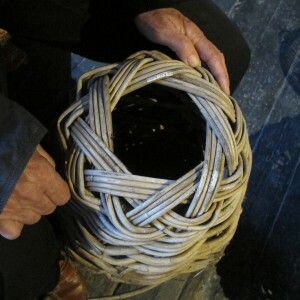 As makers will know, making a coiled basket is not easy, they are both difficult to make strong, and also take time – Dawn estimated it could take about a day, just to sew the coils together. Such labours of love would require some experience and, as the second one illustrated here from Wester Ross shows, needed a special kind of affinity to enjoy the process. We are still pondering on the material used to sew the coils together, though a little book, the Basketmakers of Newstead and Nes,s suggests it may have been marram root. 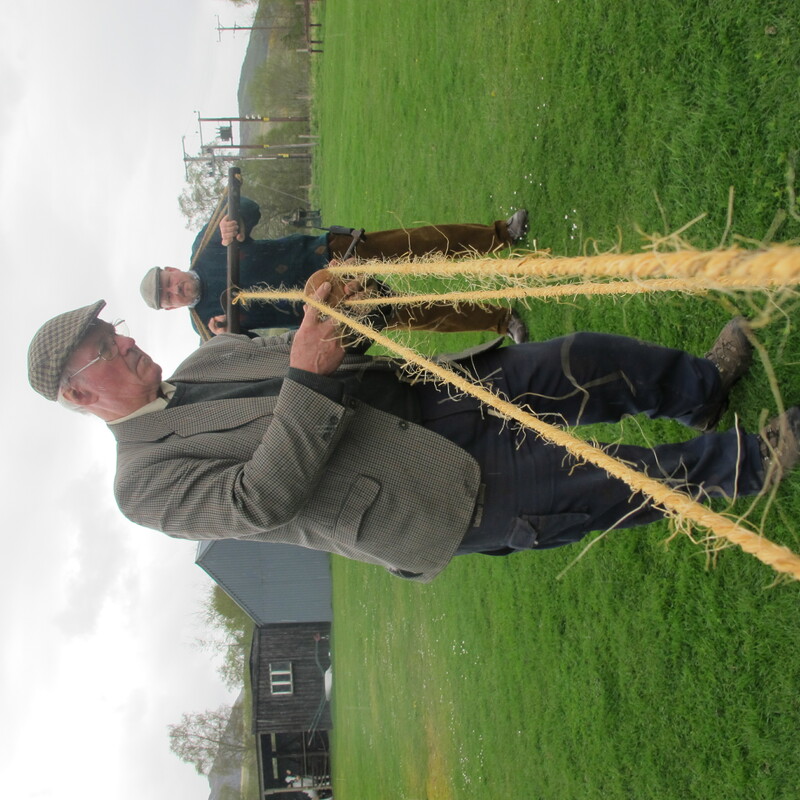 A return trip to the Highland Folk Museum gave the opportunity to research the ropes in greater detail. 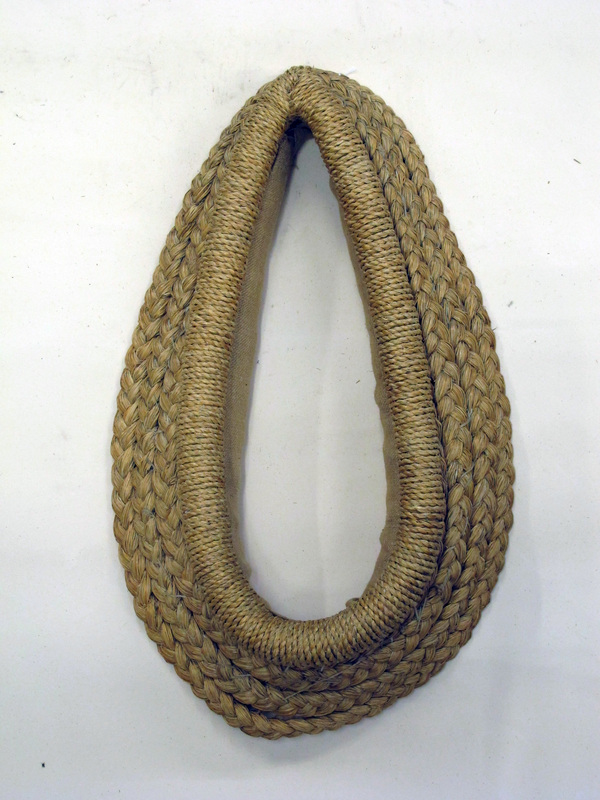 We had decided that we would take the theme ‘From the basics to the best’ at the museum, and needed a little more work on ‘the basics’ – hence the need to look at ropes. Rachel the curator kindly let Steph look through all the thraw crooks, or rope twisters, in the collection. These ranged from being entirely made from wood, to twisters which could ply the rope. 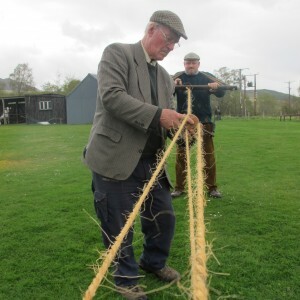 3 volunteers demonstrated making plyed rope with baler twine using a rope-walk which was extremely helpful. Then came one of those moments you can only hope for in a museum. Rachel had set out all the rope boxes for Steph to go through. One, very small, which said ‘fishing rope’, did not look very promising. 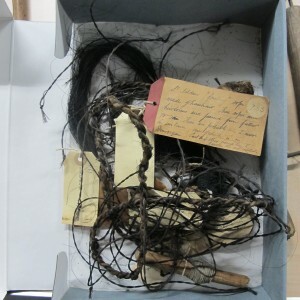 Inside however was a label which said “ St Kilda fowling rope made of horse hair. These ropes were heirlooms and passed from father to son. 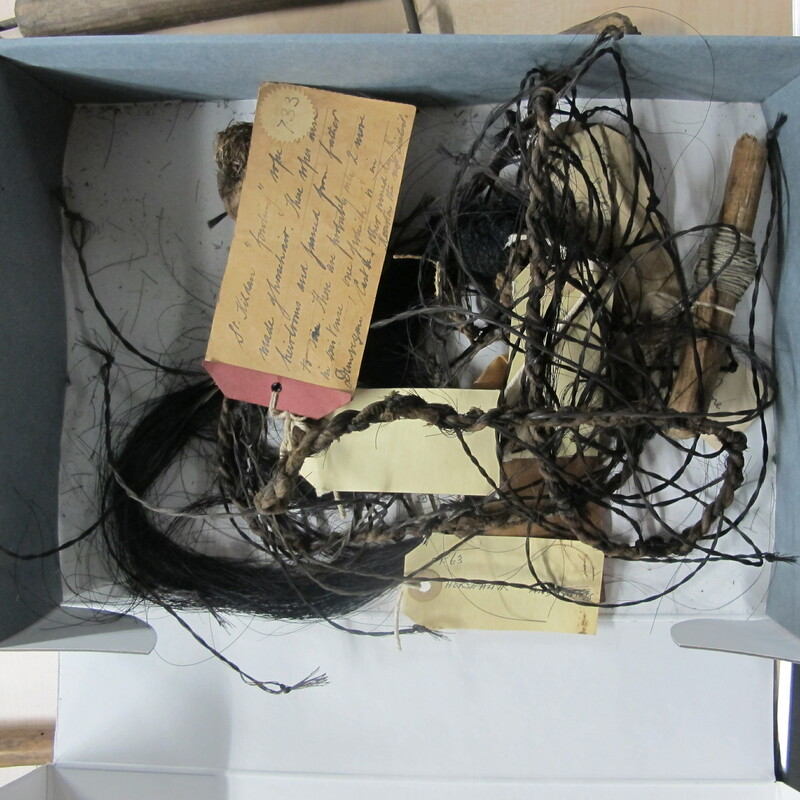 There are probably only 2 more in existence…” The box contained these very ropes, made for guga (baby gannet) hunters on St Kilda, and also some horse hair puffin snares. Extraordinary to be able to witness such a unique artifact. Then onto the Museum of Rural Life at East Kilbride with Liz and Julie. The Museum of Rural Life is a part of the National Museums of Scotland. It is a working farm, and is also a museum documenting rural life of Scottish lowland areas. 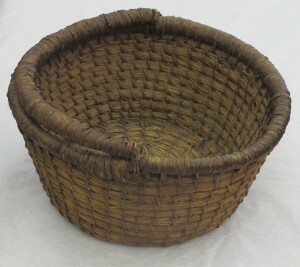 Remarkably, the entire National Museum’s Scottish basketry collection was recently moved there from its former stores at Leith Customs House and also Port Edgar in Edinburgh. 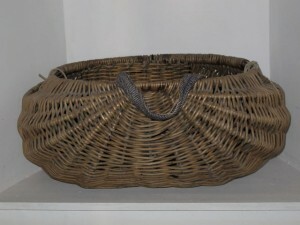 These collections, added to the working rural baskets already at the Museum, make it one of the most important collections of baskets in now in Scotland. Most significantly is the Rintoul Baxter Collection, made by two women bird-watchers who travelled across Scotland in the 1920s, and gathered together significant examples of regional basketry on their travels. 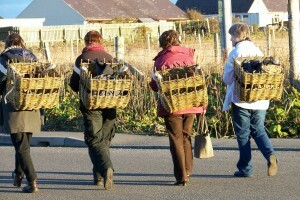 The collection includes an outstanding Orkney heather caisie; several Shetland kishies and budies made from straw and dockens; diverse east coast fishwives’ creels with sculls to go on top; long-line baskets; and ‘buttock’ and other frame baskets. The collection also holds the famous woven plata mhuillin collected by Erskine Beveridge in the late 19th century; a stunning collection of straw hairst knots; an Orkney straw hat-making kit; and a range of tattie sculls and fruit baskets. Our final research trip was to the Scottish Fisheries Museum in Anstruther. 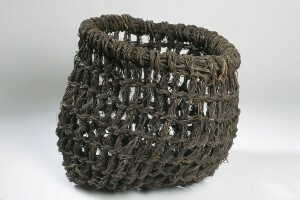 This museum both has a definitive collection of east coast fishing baskets and a wonderful photo-archive. We explored the different kinds of long-line baskets there, the woven fenders, and the fish baskets – from quarter crans to general baskets for moving fish around. 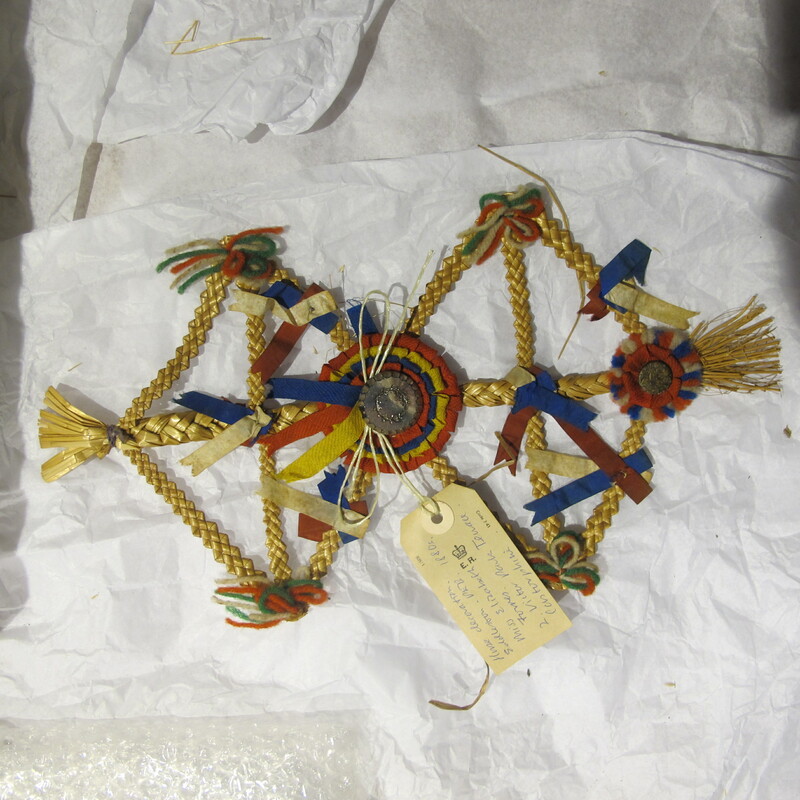 One question which vexed us, as we developed our research, was to find the kinds of creels carried by fish-wives from the East Neuk of Fife itself, where the Museum is based. We could see a particular kind of creel typified Edinburgh and surrounding region (Newhaven, Musselburgh…), a second kind was typical for Aberdeenshire, and a third for Arbroath. But, given that this is a museum based in Fife, it was surprising that no creels were attributed to this region. There was however, a rip of the Arbroath kind usually worn on fish-wives backs, with no attribution, and finally we found an old photo of a woman from St Andrews carrying one. So, at the moment, while nothing is certain, the evidence points to East Neuk fishwives carrying the same kinds of unusual rips as those from Arbroath. This is just a brief summary of the project so far. We have just begun the event stage where we go out to the local communities and conduct a week of events in each place to see if the public will respond by bringing in their memories and stories. Dawn and Steph have just finished a week on the Uists working with An Lanntair in care-homes, seeing what techniques and baskets people remember and showing old photos and baskets from the area. We are now just beginning our sessions at the Museum of Rural Life. Still to come is a week at the Highland Folk Museum (first week of August), where Dawn will be leading workshops on Traveller frame baskets and Steph will be rope making. This is followed by 3 days at the Scottish Fisheries Museum in Anstruther where Steph and Liz will demonstrate alongside the Reaper and Liz will lead a workshop in fender making (2nd week in August). The final 2 weeks are in Shetland (end of September, first week in October) with Ewen Balfour and Lois Walpole working with elders ands school children to explore old forms and new designs. 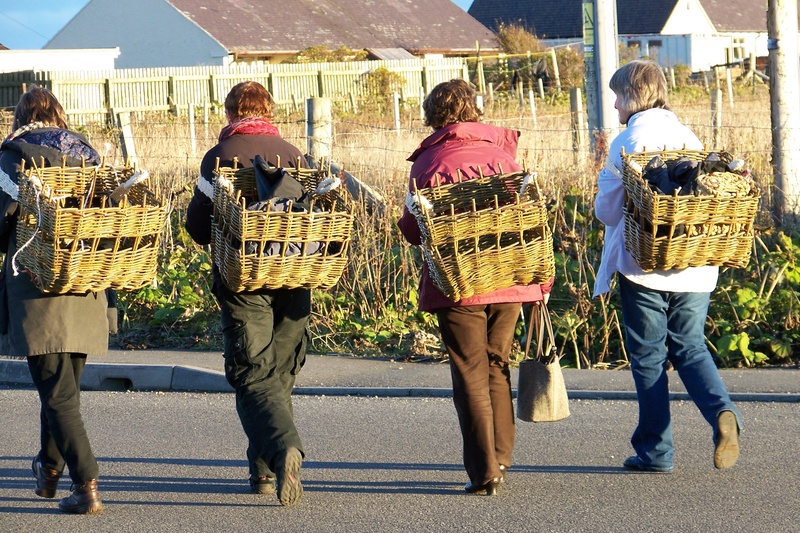 We will also be holding a Netting Bee at the Fidsheries Museum in Anstruther, and the Museum is putting on an exhibition of its baskets in September and October. We’ll be writing up and uploading reports from these sessions as we go.